A cheese curd is a small chunk of cheese, often identified as the freshest form of cheddar, says Golden Age Cheese. As whey is drained from the vats during the creation of cheddar, cheese curds remain as an end product. Most cheese curds are best within a few days of production. Be sure to review the nutritional information for cheese curds before diving into a fresh container. To understand the nutritional value of cheese curds, identifying portion size is key. According to Henning's Wisconsin Cheese, 1 ounce -- or about 28 grams -- of cheese curds equals a single portion. To make things easier, you may want to compare the size of your cheese curd serving to regular household items. In fact, 1 ounce of cheese is roughly the same size as four dice, says BreastCancer.org. 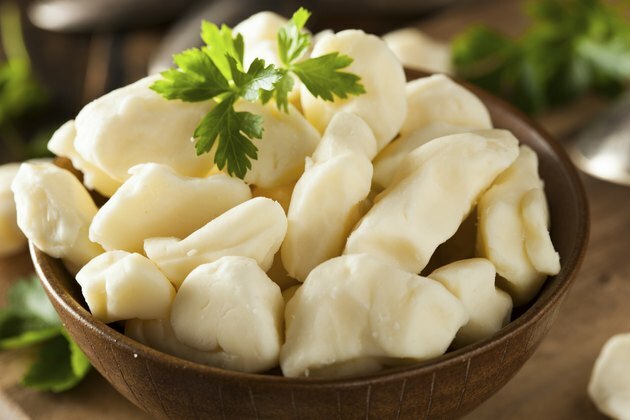 If you're on a weight-loss diet, identifying the number of calories in a serving of cheese curds is crucial. According to Henning's Cheese, there are approximately 110 calories in one serving of cheese curds -- unfortunately, most of these calories come from fat. With a total of 80 fat calories, 5.5 of which are saturated, cheese curds are far from healthy. So you should eat these snacks in moderation. While cheese curds are nearly devoid of vitamins, a small amount of vitamin A can be found. Henning's Cheese reports that one serving of cheese curds offers approximately 6 percent of the estimated daily needs of this vitamin. Because most healthy adults need between 700 and 900 micrograms of vitamin A in their diet, one serving of cheese curds likely contains between 42 and 54 micrograms of this vitamin. Though there are a number of important benefits to consuming vitamin A, it is especially crucial for eye health. Cheese curds also contain a number of minerals, including sodium and calcium. Most healthy adults are encouraged to limit their intake of sodium to less than 2,300 milligrams in a single day -- and one serving of cheese curds provides about 7 percent of this requirement. Similarly, Henning's Cheese states that individuals can obtain 20 percent of their daily calcium needs through the consumption of an ounce of cheese curds. Calcium is responsible for eye health, muscle function and the promotion of bone density, says the Office of Dietary Supplements. Golden Age Cheese: What Is a Cheese Curd?